There will be a 10% discount on all build-your-own wooden surfboard workshops in May. You can also build your board just about anytime that you want during the month of May. The discount applies to all surfboard models – mini-sims, fish, single fin, egg, mini-malibu and longboards. Our workshops – where you build your own beautiful wooden surfboard starting from a pile of planks – take five days. This offer applies only to workshop builds that take place in May. With the prices of wood, resins, glues and just about everything else continually sky-rocketing, it’s unlikely that I’ll be able to repeat this offer anytime soon, so if you’ve been wanting to do the workshop – now is your time. Making a wooden surfboard is an opportunity to reconnect with your hands and make a long-lasting, functional work of art. The process engages surfing’s history, alternative and more sustainable surfboard construction methods, and learning about surfboard design. You don’t need DIY or woodworking experience. We’ve devised a programme that everyone can follow. Both ladies and gents are welcome. Participants build their own board (it won’t be done for you). 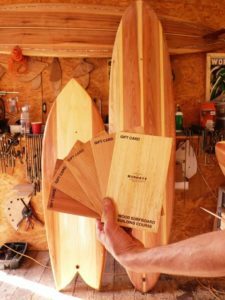 Burnett Wood Surfboards has been running workshops for six years and hundreds of people have made stunning wooden surfboards. Just have a look at the gallery below for proof. 2019 is the sixth straight year I’ve been running wooden surfboard workshops and I’m looking forward to meeting new people and seeing the beautiful surfboards that they make. I’m stunned at the surfboards people make, no matter whether they are a novice or experienced woodworker. Seeing someone’s beautiful and functional work of art take shape leaves me thrilled. The dates for 2019 are below. Workshop sizes are limited to 2-3 people to ensure the highest quality boards. Please give me a call on 073 232 3043 or email burnett.patrick@gmail.com to book. The workshop page on this website, available through this link, also has a wealth of information on the process, board shapes and prices, and check out this gallery for pictures of completed surfboards. The wooden surfboard workshops take participants through all the aspects of building a wood surfboard. The workshops look at the different types of timber, the environmental aspects and the design dynamics underpinning wood surfboards. This is combined with the practical process of crafting a surfboard from a pile of planks into a one-of-a-kind work of art that can be surfed. It’s an immersive experience in surfing and the craft associated with riding waves. 14-18 January 2019: This course will take place in the Scarborough workshop. If you can’t make these dates, get in touch and we’ll look for alternative dates to host you in the workshop. 21-25 January 2019: This course will take place in the Scarborough workshop. If you can’t make these dates, get in touch and we’ll look for alternative dates to host you in the workshop. 18-22 February 2019: This course will take place in the Scarborough workshop. If you can’t make these dates, get in touch and we’ll look for alternative dates to host you in the workshop. 18-22 March 2019: This course will take place in the Scarborough workshop. If you can’t make these dates, get in touch and we’ll look for alternative dates to host you in the workshop. 2-6 April 2019: This course will take place in the Scarborough workshop. If you can’t make these dates, get in touch and we’ll look for alternative dates to host you in the workshop. 22-26 April 2019: This course will take place in the Scarborough workshop. If you can’t make these dates, get in touch and we’ll look for alternative dates to host you in the workshop. 20-24 May 2019: This course will take place in the Scarborough workshop. If you can’t make these dates, get in touch and we’ll look for alternative dates to host you in the workshop. 22-26 July 2019: This course will take place in the Scarborough workshop. If you can’t make these dates, get in touch and we’ll look for alternative dates to host you in the workshop. 26-30 August 2019: This course will take place in the Scarborough workshop. If you can’t make these dates, get in touch and we’ll look for alternative dates to host you in the workshop. 21-25 October 2019: This course will take place in the Scarborough workshop. If you can’t make these dates, get in touch and we’ll look for alternative dates to host you in the workshop. 25-29 November 2019: This course will take place in the Scarborough workshop. If you can’t make these dates, get in touch and we’ll look for alternative dates to host you in the workshop. 9-13 December 2019: This course will take place in the Scarborough workshop. If you can’t make these dates, get in touch and we’ll look for alternative dates to host you in the workshop. This is the ideal Christmas gift for surfers: Give the unique gift of crafting a stunning wood surfboard in one of our regular workshops. The popular gift certificate gives guaranteed access to any workshop and makes a very special birthday, anniversary or Christmas present for your loved one, whether husband, wife, father, son or daughter. The workshops are a unique offering available to the surfing market in South Africa and are currently in their sixth year. Participants build their own eco-friendly, beautiful wood surfboards. The workshops are a hands-on experience: participants literally start out with a pile of planks and set about constructing a surfboard shape out of wood and then hand shaping the surfboard through to the finished form. 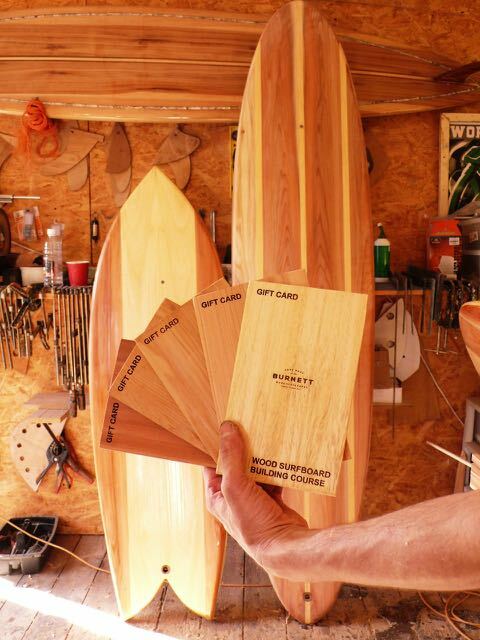 Gift card holders have access to our regular five-day workshops scheduled for 2019 and beyond where participants build their own wooden surfboard under expert supervision. A limited number of workshop positions are available in any given year; gift card holders can pick and choose their dates and if they can’t make the scheduled dates they can book in on dates that suit them. In this special offer, all surfboard shapes up to 6′ are R8,800. Longboards are R10,500. This is all inclusive of tools, materials, tuition and assistance and glassing. There are no hidden costs. We can courier the gift cards anywhere in South Africa and the world. Hundreds of wooden surfboards have been successfully made in our workshops. Here is a picture gallery of some of these boards. Contact Patrick on 073 232 3043 or burnett.patrick@gmail.com to arrange a gift card. Our original and all-natural bodysurfing handplanes are handcrafted from locally grown wood and make the ideal Christmas gift for anyone interested in aquatic pursuits. Bodysurfing is one of the purest and most fun way of riding a wave that there is, and it is gaining in popularity amongst ocean users. Using a bodysurfing handplane to enhance the experience takes bodysurfing to the next level, enabling greater control on the face of the wave and the ability to truly surf down the line. 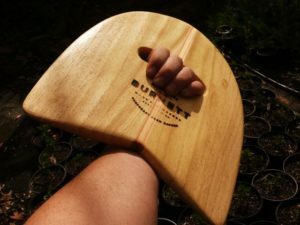 Bodysurfing hand planes from Burnett Wood Surfboards cost R850 each, and this includes door-to-door courier to anywhere in South Africa. Please contact Patrick on 073 232 3043 or email burnett.patrick@gmail.com to arrange your order. I’ve been an avid bodysurfer for several years. All of the bodysurfing handplanes that I make are tried and tested in a variety of conditions. Bodysurfing has enabled me to get in the ocean more often. It keeps me fit because you’re pulling your own bodyweight through the water and into waves. And it’s a wave riding discipline all on its own, with a variety of tricks and techniques to learn that has only enhanced my ocean adventures. I’ve just released the 2018 dates for the wooden surfboard workshops I hold where people can build their own beautiful wooden surfboards. This is the fifth straight year I’ve been running the wooden surfboard workshops and I’m looking forward to meeting new people and seeing the beautiful surfboards that they make. In 2018, I’m adding to the available workshop options over the dates advertised. People can book in for the traditional wooden surfboard experience that takes five days, where they start out with a pile of planks and end up with a finished wooden surfboard. In addition, I’m also offering a two day option where people can shape their own finless alaia over two days and learn about what went into the making of this Hawaiian surf craft from hundreds of years ago. Finally, there is also the one-day option where people can build-your-own bodysurfing hand plane. For more information on the courses, including the available board shapes to choose from, the scheduled dates and costs, please click on this link. Feel free to email Patrick on burnett.patrick@gmail.com with questions and check out the epic picture gallery below for some of the amazing boards built on the workshops.